1. Confirms the minutes of the meeting of the Forestry Advisory Group, held on 6 December 2018, as a true and correct record. 3. 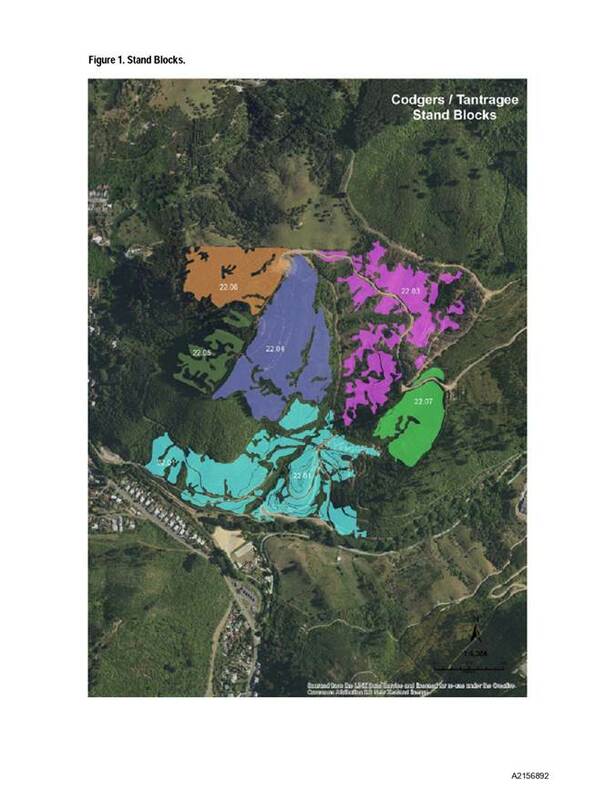 Approves the revegetation plan for the Codgers/Tantragee block as per Attachment 2 (A2156892) of Report R9942. 1. 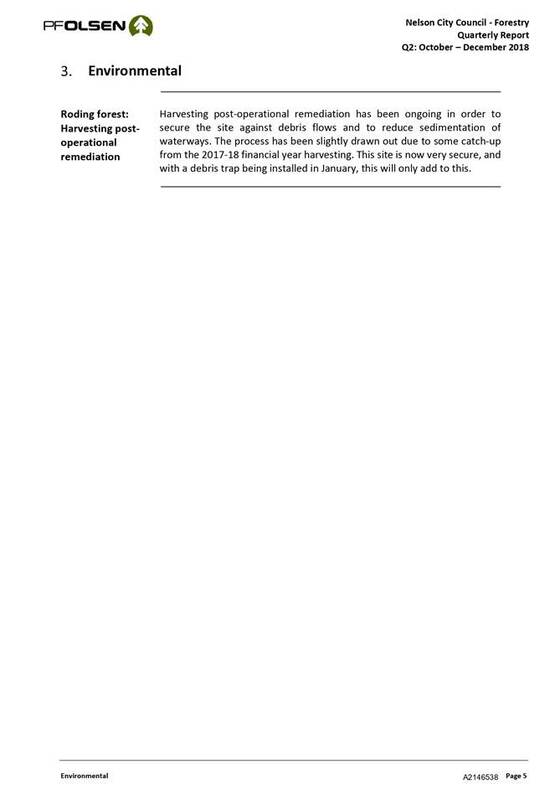 Confirms, in accordance with sections 48(5) and 48(6) of the Local Government Official Information and Meetings Act 1987, that Sam Nuske of PF Olsen and Lachie Grant of LandVision remain after the public has been excluded, for Item1 of the Public Excluded agenda (Public Excluded minutes – 6 December 2018), as they have knowledge relating to advice provided in the public excluded session of the meeting on 6 December 2018 that will assist the meeting. On Thursday 6 December 2018, commencing at 3.00p.m. It was noted that the meeting would consider the public excluded business first. 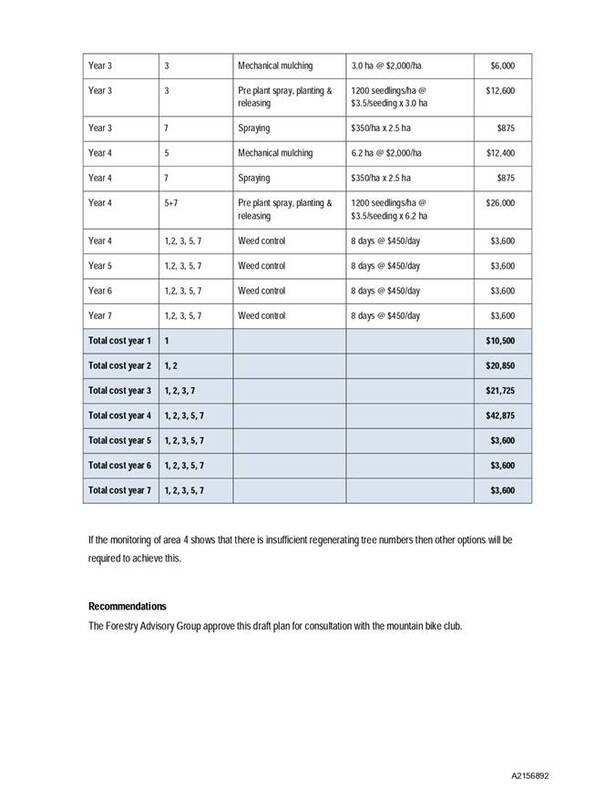 Document number M3753, agenda pages 5 - 10 refer. Attendance: Her Worship the Mayor joined the meeting at 3.03p.m. Confirms the minutes of the meeting of the Forestry Advisory Group, held on 11 September 2018, as a true and correct record. Confirms, in accordance with sections 48(5) and 48(6) of the Local Government Official Information and Meetings Act 1987, that S Ritchie of Fletcher Vautier Moore, Lachie Grant of LandVision, and S Nuske, K Richards, G Brown and D Fincham of PF Olsen remain after the public has been excluded, for Item 1 of the Public Excluded agenda (Tantragee Block Harvesting: Legal Considerations), as they have knowledge relating to the matter that will assist the meeting. The meeting went into public excluded session at 3.04p.m. and resumed in public session at 4.28p.m. Attendance: Her Worship the Mayor R Reese left the meeting at 4.29p.m. Document number R9689, agenda pages 11 - 49 refer. Discussion took place regarding good management practices. The application of the new National Environmental Standards (NES) was considered a minimum requirement for harvesting and that each site should be assessed case by case as to whether there was a need to go beyond the NES. 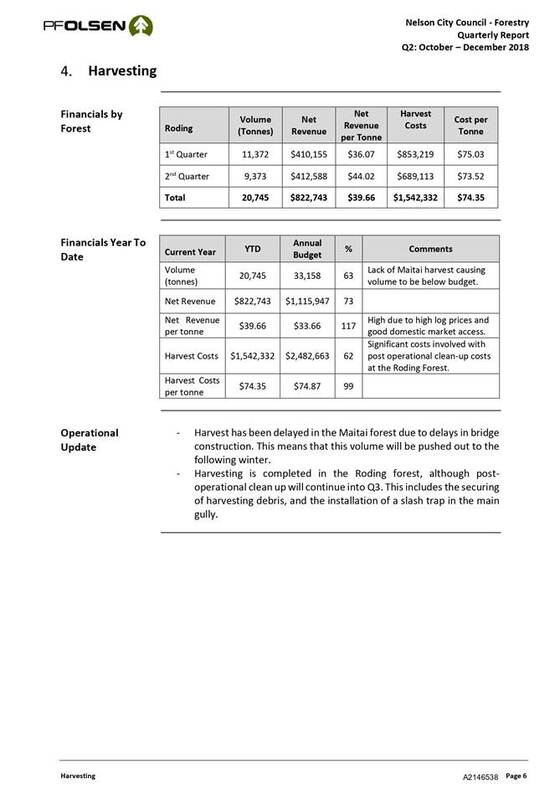 It was noted that if bridges spanning the rivers in the Maitai and Roding forestry blocks could not be put in place for the 2019 harvest, a revised harvest schedule would be brought back to the Forestry Advisory Group, including revised budgets. 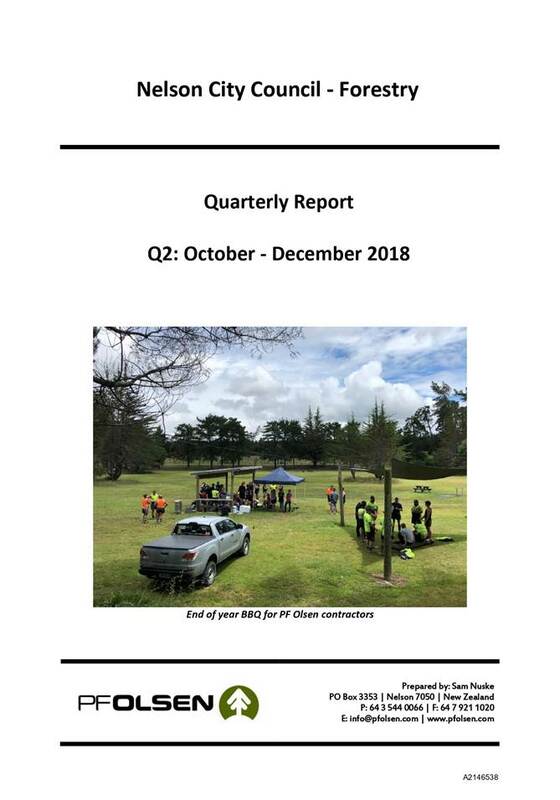 Receives the report Forestry Update – Number 6 – December (R9864) and its attachments (A2077577, A2077575, A2077572 and A2090601). There being no further business the meeting ended at 4.50p.m. 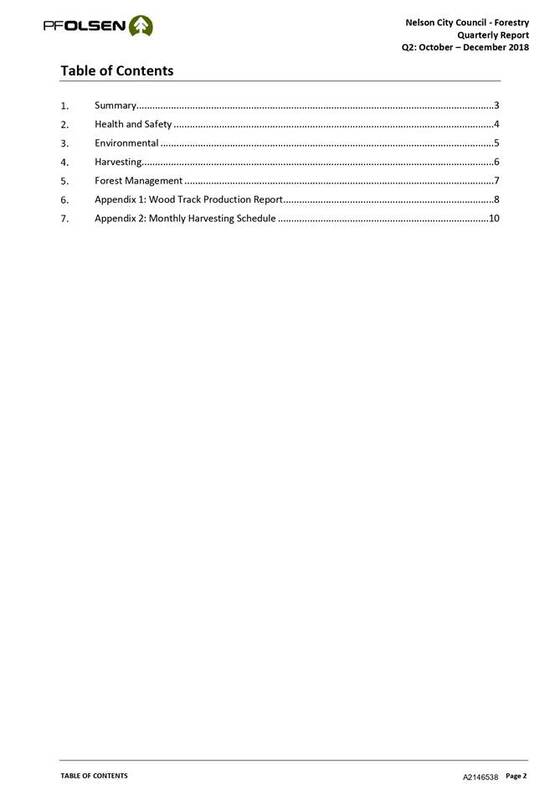 1.1 To provide an update to the Forestry Advisory Group (Group) on forestry activities since Council adopted the Forestry Review recommendations in September 2016 and since the December 2018 update. 3.1 Harvesting is complete in the Roding forest. 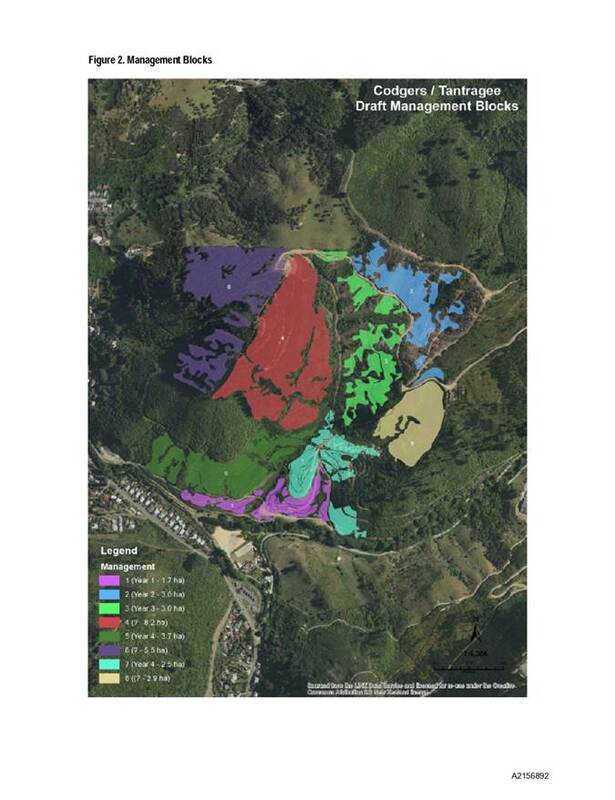 3.2 Planning is well underway for harvesting in the Maitai forestry blocks, which is now expected to commence in the winter of 2020. This is a year later than previously anticipated and as advised to the Group. The main reason for the delay relates to assessing options and costs for a new bridge required to span the Maitai River that will enable harvesting to progress. That cost is estimated at $250,000, but will provide long-term access for future harvesting. 3.3 Progress is detailed below. To be undertaken in conjunction with the privately owned adjacent forest block but no timeframe has been provided by their harvester. Group resolved in September 2018 to consider harvesting the remaining 3Ha in 2022 and to re-plant the rest of the block in radiata. Group resolved that this block not be cleared until the trees can be commercially harvested around 2027 with a review to be undertaken in 2022. Within Cemetery block - summer harvesting only (possibly 2020) and subject to contractor availability. Will depend on fire risk. PF Olsen, Peter Gorman and Lachie Grant to assess risk of Douglas Fir wilding spread from such a small block and to advise to either harvest or not harvest. 3.4 The potential for Emissions Trading Scheme (ETS) liabilities was reported to the December 2018 meeting and is not replicated here. Approves the felling to waste of the remaining Brook block 21/04 at an estimated cost of $10,000. Includes poisoning and fell to waste. To take place during low public use and will be co-ordinated with MTB Club and BWST. Poisoning is complete. Consultation on felling with MTB Club and BWST has commenced. All operations will be undertaken in accordance with new NES standards and good practice. Felling to waste is scheduled to take place towards the end of winter 2019. 3.5 The Group approved that the “Tantragee Block” be harvested/felled to waste/poisoned, with urgency, to address health and safety concerns, subject to the preparation of a site specific plan by PF Olsen and approved by the Independent Forestry Expert. 3.6 Following the presentation by PF Olsen to the Group in December 2018 on options to achieve this harvesting, the Committee requested PF Olsen to undertake more work and report back to the April 2019 meeting. 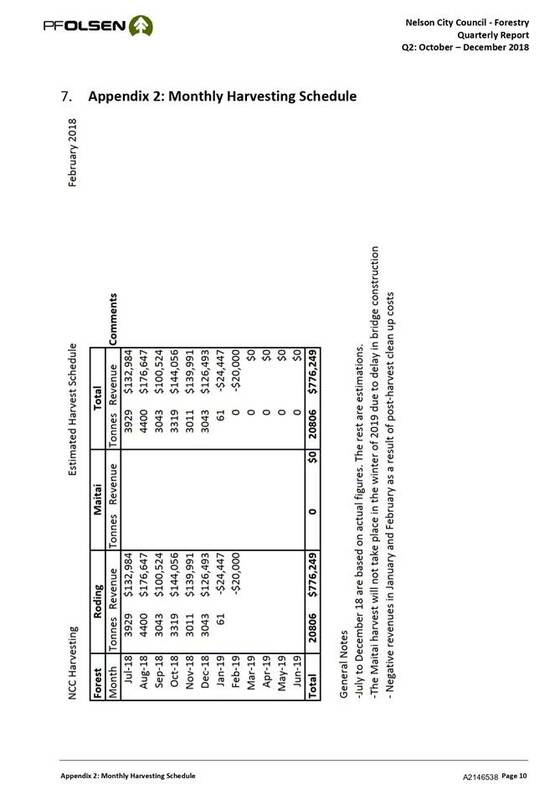 PF Olsen will present their updated progress plan and estimated cost at the meeting. 3.7 Once the plan is approved in principle, consultation via a face-to-face meeting with the affected residents will take place. A harvesting date is yet to be determined and is dependent on approval of the plan and consultation. 3.8 PF Olsen have been actively involved in the Pigeon Valley Fire since 7 February 2018. This has included assisting the FENZ Incident Management Team, fighting the actual fires and making their offices available to Civil Defence. In addition work in the forests was strictly curtailed following the fire ban imposed on the area. 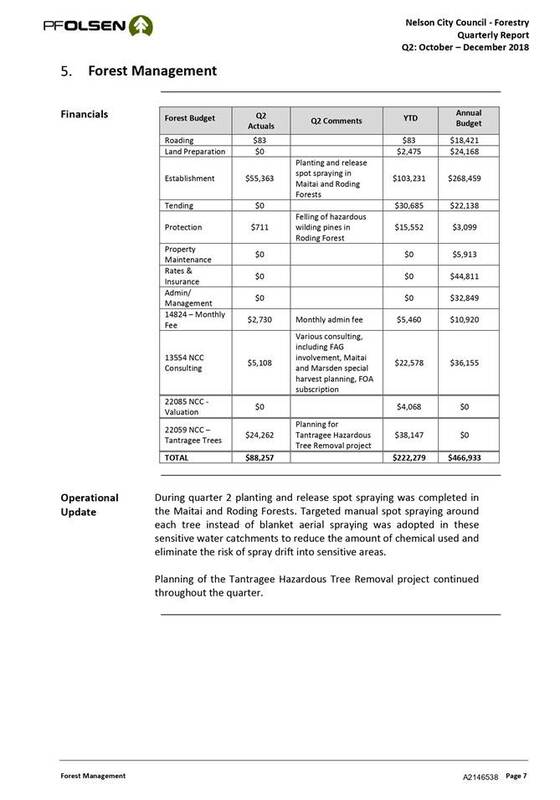 3.9 The small area of Council owned forest adjacent to the Waahi Taakaro golf club has yet to be harvested by Tasman Pine Forests as part of their larger block. 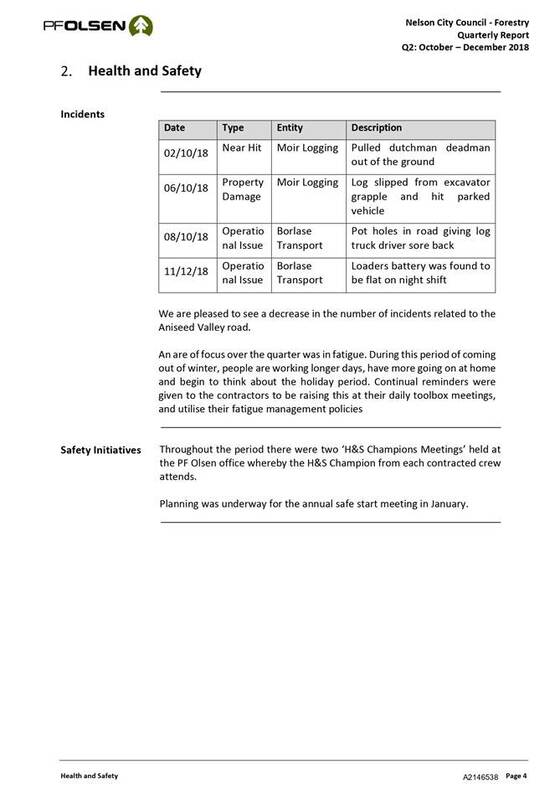 3.10 No Safe Work Observations (SWO) were undertaken this quarter by Peter Gorman. A joint SWO with the entire Group will be undertaken when the Maitai harvesting work recommences. 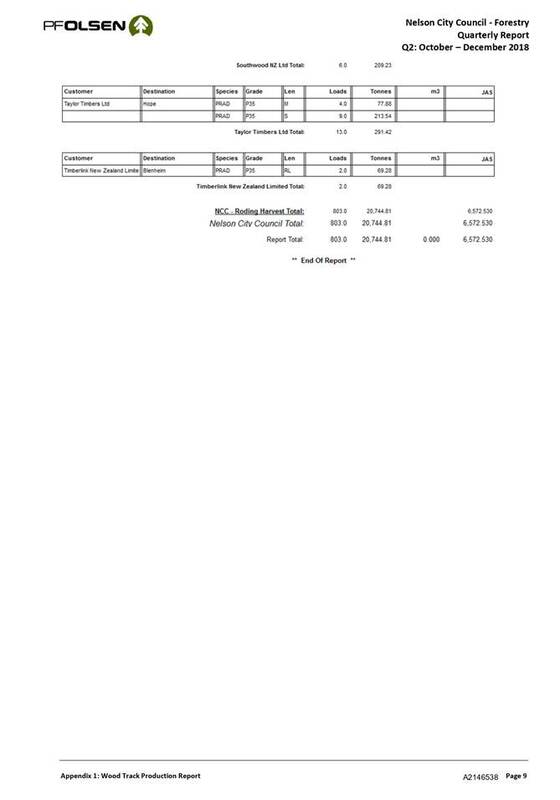 3.11 Harvesting net revenue for this quarter was $412,588 against the full year budget of $776,249 (revised down from the previously noted $1,115,947 as a result of the delay of harvesting of the Maitai blocks). Refer to Attachment 1 – PF Olsen Quarterly report (October 2018 to December 2018) - the Quarterly report reflects the delay in this harvesting. 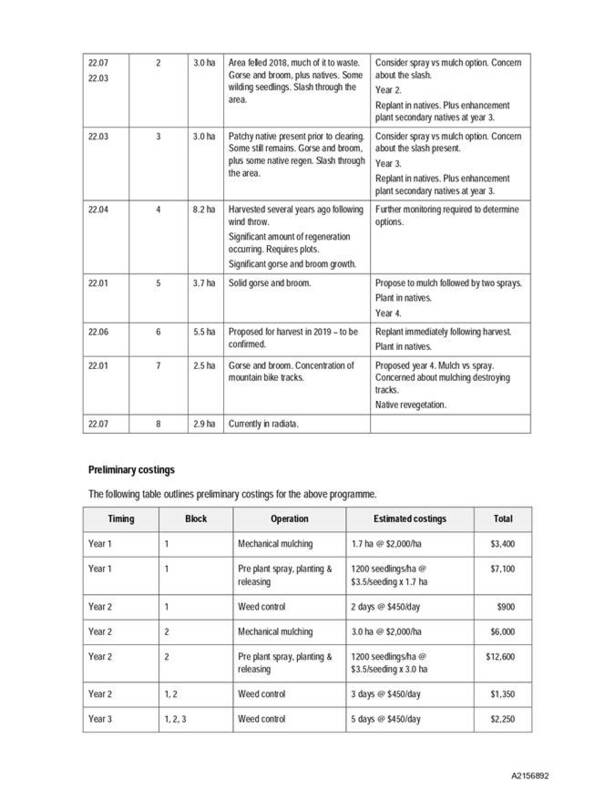 4.1 The 5 year harvesting Plan will be changed to reflect the Maitai Block harvesting moving to the winter of 2020. 5.1 PF Olsen has completed the slash trap in the Roding catchment. 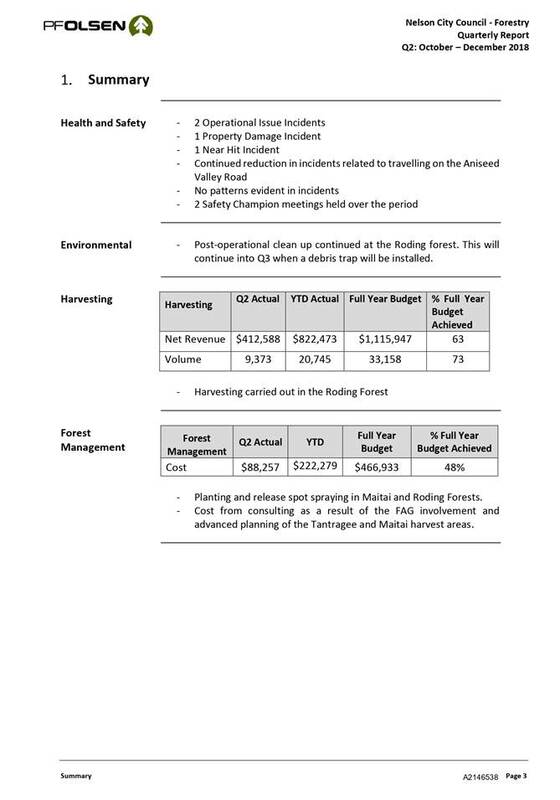 6.1 Council agreed to retire some 140Ha of forestry and consider alternate uses. The Group resolved at the 12 June 2018 meeting as below. Approves the revised specific site plans as presented by LandVision at the 12 June 2018 Forestry Advisory Group meeting, subject to further refinement on financial implications, priorities and consultation, relating to Alternate Use of the stands to be retired from commercial forestry. 6.2.1 The Brook block (21/04) replanting – Plants have been ordered and spraying was undertaken in early February. Breakdown of gorse and broom will be re-assessed prior to winter and the need for a second spray assessed at that time. However, it is unlikely that this block will be ready for planting this coming season and the plants will be used at the Maitai Dam under the MPI Memorial planting. 6.2.2 The application to the Hill Country Erosion Fund, through Environmental Programmes, for 50,000 native re-vegetation seedlings per year from 2020 for four years has been successful. These seedlings will be used between the Nelson Forestry land and forest retirement on private land. 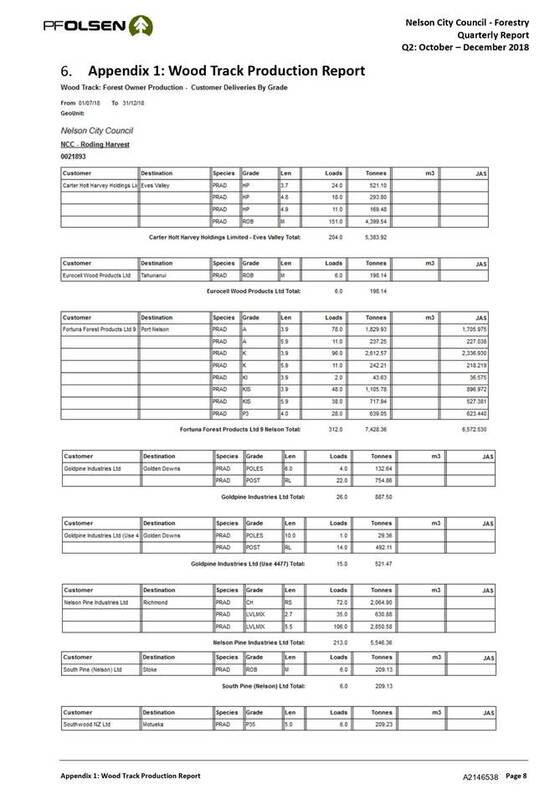 The table below shows the breakdown. 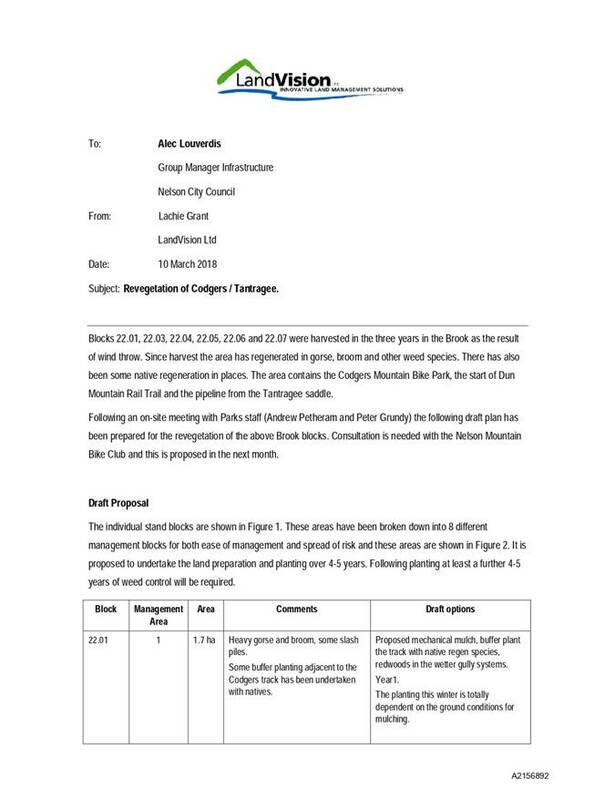 6.2.3 Lachie Grant has prepared a revegetation plan for the Codgers/Tantragee and that report is appended as Attachment 2. 7.1 PF Olsen has finalised the draft FSC management plan and will prepare a consultation document that will come back to the Group for sign-off before consultation commences. Any feedback from that consultation will be considered for possible inclusion in the final plan before seeking accreditation. 7.2 Following a presentation by PF Olsen at the December meeting, it was agreed that consultation would wait on the outcome of the more detailed harvest planning being carried out on the sensitive harvest areas in the Maitai, Tantragee and Marsden Valley forests and incorporating those lessons into the planning and consultation. The regular updates support the effective and efficient management of Council’s productive forests. The Group aligns with the following outcomes: “Our Council provides leadership and is supported by an innovative and sustainable economy”. The Group has been set up to specifically have an oversight on all things relating to forestry to reduce the risk to Council. The Group has been set up to monitor forestry activity and to manage income and expenses accordingly. The expenditure recommended in this report is in line with this oversight. This update report is of low significance. The Group has assessed the Alternate Use Management Plan and agreed on an appropriate level of engagement on specific sites.